What a beautiful photo you kindly shared with me and visitors to my website. I can't get over all that you captured in one photo, the Allegheny Mountains, the valleys, the dew that lingers and the beautiful wilderness. It's a shame how many people travel through PA on the interstate highways and never really see the peacefulness and opportunity to enjoy nature again. 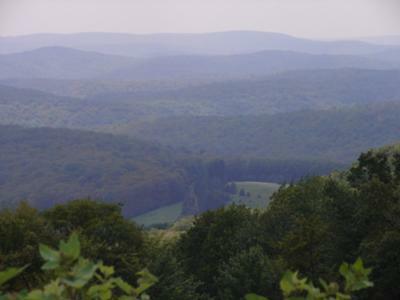 Your photo proves that the best things in PA are free. Thanks you so much for sharing this photo, and thank you for taking the time to get off of RT. 81. I hope you'll explore more of PA. I can't help but wonder where you found this area to take this photo.